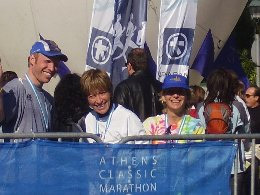 Rebels flew to the home of the marathon to run the original course in Greece. All had a GREAT time, GREAT weather, and LOTS!!!!! of hills!!!! Greece was just absolutely fabulous!!! We had a great time and great weather all week-sunny and blue skies every day. We arrived in Athens Friday night, dropped our bags off and went to the highest point in Athens, Lycabettus Hill, 910' above the city. Beautiful view of the city at night but it was quite chilly and very windy. Saturday we had a 1/2 day tour of Athens and the Acropolis. 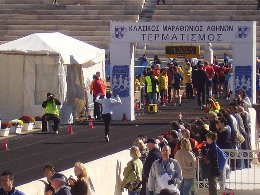 Saw the Panathanaiko Stadium being readied for the marathon, COOL! Then runners went to the expo which was at the OLD airport way outside the city. Not much more than technical details there(picking up chip,shirt,etc...). The ride back on the tramway was nice along the southeast coastline of Athens ... saw some beach towns. Ginny and Carla walked around town, saw Zeus' house, and went shopping. That night we all went to a local fast food kinda place for some greek-like pasta. Marathon day we were up early and on the bus by 6am. The bus took the course backwards out to the start--- oh my my that was a long downhill!! Got to the start it was 39F!! (Perfect for me Darlise!!!!) And very breezy! 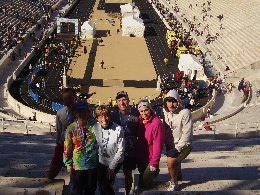 The start at Marathon was at a small stadium that I think was built for the 2004 Olympics for the athletes to warm up around. Fortunately for us there was a small building to hunker down in against the weather. Started lining up @ 8:15 for the start. The course was pretty tough. 1st 10k was slightly downhill and then flat. Then we went uphill to 15k, flat, and then short, sharp downhill from 16-17k. Then 18k is where the long, gradual uphill was until 32k. Then the last 10k was downhill(thank GOD!!) At the 5k spot there was a memorial to the warriors who fought at the Battle of Marathon in 490 bc. And I know you all know the story about Phidipidis. Just be glad the marathon event doesn't include the 458k he ran a week before his 26k jaunt!!!!!!!!!!! Linda came in next with a PR time of 4:36:25, and then Johnny Coco with a PR of 4:47:52!!! Wes, you were right... Behold the power of OUZO!!!!!!!!!!!!! 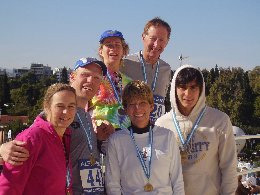 And we celebrated with it a few times during the week after the marathon!! That night we walked around the Plaka shopping area and had a good dinner. Went back to hotel and packed for our cruise. The cruise was nice, the Islands were BEAUTIFUL, and the water was this...!Mediterranean! blue!!! Imagine that!! This story is getting long and there's WAYYYYYYYYYYYY too many stories and good times to recount in an e-mail.